Hemoglobin is an iron-containing protein present inside the red blood cells that normally transports oxygen in the blood and delivers it to all the organs in the body. Thalassemia is a genetic defect involving this hemoglobin protein. The inherited defect in the hemoglobin interferes with its oxygen-carrying capacity, thereby depriving all the organs including brain and heart from getting adequate oxygen, leading to brain disorders. In addition, this defect leaves the red blood cells more liable to destruction, thus decreasing the amount of healthy red blood cells and causing anemia, a type of blood disorder. In case of Thalassemia minor, a mild form of Thalassemia you may not develop any symptoms, however in case of Thalassemia Major, a more severe form of Thalassemia you can develop problems such as easy fatigability, generalized weakness, and lethargy, a pale look and yellowish discoloration of the skin, distention of the abdomen as well as malformation of the facial bones. 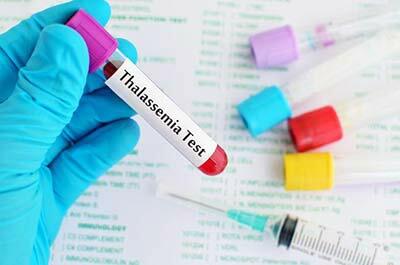 History of disease in a family, cousin marriage and origin from certain ethnic descent are some of the commonly attributed factors to increase the risk of developing Thalassemia. Today cousin marriage is declared illegal in most of the developed world; however, it is a commonly practiced tradition especially in the developing countries. Whatever the case may, from a strictly medical point of view, this practice causes pooling of the defective genes in some families, thus increasing the risk of Thalassemia transmission. Thalassemia is more commonly found in people with the Middle Eastern, Asian and African Italian or Greek ethnic descent. Treatment is needed only for patients with Thalassemia major and intermedia. There is no treatment required for the Thalassemia minor. The main problem with Thalassemia major is that these patients have severe anemia. The level of Hemoglobin is low, up to 4 in these patients as compared to 12-14 in the normal people. Thus, the whole aim of the therapy, in this case, is to maintain an adequate hemoglobin level along with the avoidance of side effects associated with this therapy. Like I said the aim is to keep hemoglobin level above 10 that can be achieved only with repeated transfusions. The amount of blood required varies according to the weight of the patient however, usually, a patient suffering from Thalassemia major is transfused every 1 -2 month. The main problem with the repeated blood transfusion is that it causes a buildup of iron in the body. Excessive iron gets deposited in the liver, brain, heart as well as endocrine glands such as the pancreas, thyroid and parathyroid gland resulting in their dysfunction over the period of time. This is why iron chelating agents and other substances such as ascorbic acid are used with the aim to prevent this build up of excessive iron in the body. In some cases, the spleen may also be removed with the aim to decrease the number of transfusions required as this is where red blood cells are broken down. Bone marrow transplantations and gene therapy are also being attempted and could come as ultimate treatment options for Thalassemia major in the future. If you would like to speak to a primary care physician, come to Century Medical and Dental Center (Downtown Brooklyn, Gravesend, and Flatbush) for a consultation today.